Click on a service to view detailed description. This treatment should not be confused with diagnostic ultrasound, often used in prenatal screening, but is instead a therapeutic procedure that utilizes sound waves to treat injured muscles, joints, and soft tissues. The sound waves vibrate the tissues back and forth, creating a deep, micro-massage effect. In the case of a recent injury, this helps to decrease scar tissue and adhesion formation, which would otherwise interfere with the body's healing process. The sound waves also accelerate healing by stimulating the activity of the cells responsible for cellular and tissue repair. In chronic cases, special settings are used to create a deep-heating effect, heating the tissues far below the skin's surface. This heat, along with the vibrations that are caused by the ultrasound, help to “melt away” the muscle spasms and “knots” felt in our muscles. What is Ultrasound? Ultrasound uses high-frequency sound waves and it is administered in the region of soft tissue injuries. How does Ultrasound work? The sound waves, some moving with a frequency of 1,000,000 waves per second, penetrate deep into the tissues. The vibrations and heat break down muscle spasm and scar tissue. What does Ultrasound feel like? During the treatment most patients either feel nothing, or a pleasant and relaxing sensation below the skin's surface. Why is Ultrasound used? The treatment can be administered directly to the affected area and it penetrates deeply. As the temperature rises, blood flow increases and muscle spasms relax thus speeding up the healing process. What are the benefits of Ultrasound? Ultrasound stimulated healing without irritation and enhances the body's natural healing ability. It is effective in treating muscle spasm, speeds metabolism and improves blood flow and reduces nerve root irritation. Often referred to as “muscle stim,” the therapy involves low levels of electrical impulses delivered to the injured, painful tissues to reduce pain and speed healing. Often described by patients as a pleasant, “tingling” sensation, or “electrical massage,” these impulses stimulate the body to release natural pain relievers called endorphins. These endorphins reduce pain and inflammation, thereby promoting faster healing of the injured tissues. This therapy is often used to treat acute or chronic pain as well as strains or sprains of the muscles, joints, and soft tissues of the spine and extremities. What is Acupuncture? An acupuncturist, in observing symptoms of disease, is able to locate the points on the body that governs a particular section of the channel that is blocked. The acupuncturist then stimulates these points to clear the channel and allow the life energy to flow freely again. How does Acupuncture work? Acupuncture works in two ways. First, the theory of meridians and collaterals is used as a main guide to treatment and points from adjacent areas are selected. Therapeutic results may be obtained by regulating the circulation of energy and blood flow through these meridians and collaterals. Secondly, when a needle is inserted into the skin, it sends a signal to the spinal cord and brain to modify a particular body function. Will Acupuncture help with my condition? Because it stimulates the body’s ability to heal itself, acupuncture is a valuable complement to conventional medical treatment of many conditions. In 2002, the World Health Organization published a review and analysis of nearly 300 controlled clinical trails on acupuncture and concluded that it is useful in the treatment of over 90 diseases, symptoms and conditions including: allergies, low back pain, sciatica, neck pain, shoulder an elbow pain, knee pain, figbromyalgia, arthritis, headaches and many others. How many treatments should I expect with an Acupuncture protocol? The required treatment times depend on different conditions of each person and response to acupuncture. Recent injuries and conditions seen at an early stage will often improve immediately. Those conditions that have been present for longer periods may require more treatments. In the beginning stage of treatment, 2-3 times per week are recommended. A course of treatments for recent problems in a healthy person may range from 2 to 5. In a person with many health problems and a chronic disease, as many as 7 to 15 sessions any is required before an initial response is seen. What are the risks of Acupuncture? Is it uncomfortable? At Cook Chiropractic, the use of sterile, disposable needles ensures that there is no risk of disease transmission. The needles are very thin and are much smaller than the needles used in the familiar hypodermic injections. Electrical acupuncture is also available for those reluctant in the use of needles. Cryotherapy is a term that describes the application of ice compresses to reduce the temperature of tissues directly on or below the skin surface. Cryotherapy works on the surface constricting blood vessels, numbing painful areas, and relaxing muscle spasms. Cold temperatures reduce nerve transmission of painful symptoms and provide temporary relief. Cooling affected tissues is effective in reducing and preventing post-traumatic swelling. Local cooling should be applied several times a day during the initial stages of an injury. Patient Benefits: Helps reduce swelling and inflammation, Numbs affected area to reduce pain, Reduces muscle spasms and is inexpensive and can be self-applied. For many patients, eliminating pain is only the first step. Many people decide to correct the cause of the problem, so the pain doesn’t come back. During the correction/rehabilitation phase of care, the focus is on strengthening the soft tissue around the joint. This structural approach is designed to help prevent a relapse back to relief care. The adjustment made by the chiropractor consists of a high-velocity, short lever thrust applied to a vertebra which is often accompanied by an audible “click.” The audible sound is caused by the release of oxygen, nitrogen, and carbon dioxide causing a release in joint pressure (cavitation). 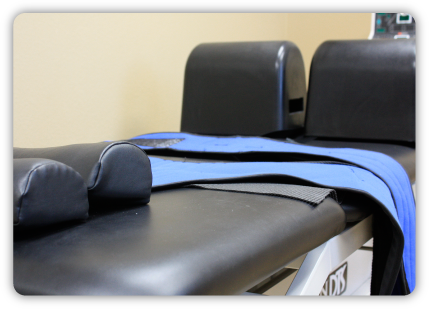 Decompression Therapy is a non-surgical means of relieving pain to the lower back and neck and is often referred to as spinal decompression therapy. Decompression therapy is a spinal disc rehabilitation program that slowly and gently stretches the area of the spine while decompressing the discs. This type of treatment is considered to be very safe. Using this technique in stretching the spine allows a vacuum effect to happen inside the discs. This type of pressure can help to pull the herniated material back inside the disc, taking pressure off the nerve root and relieving the patient of pain. Very small steps are taken during each therapy session. The therapy sessions usually take place over a period of four to six weeks and often end with dramatic, positive results. Cold Laser Therapy is a fairly new innovative technology that is useful in the treatment of many conditions such as; planter fasciitis, tennis or golfers elbow, myofascial pain and sports injuries such as sprain/strains. Cold laser is a “light” therapy that is totally painless. It works by speeding up cellular activity at the injured site to help reverse the inflammatory response and speed up collagen and elastin formation. KinesioTape is a special elastic type tape that is used to treat several conditions. The elastic properties of the tape allow for the joints to be supported but have complete range of motion. You can tape joints for a structural support or you can tape specific muscles that may be affected by an injury. The tape also helps to lift the fascia that covers the muscles and allows for increased lymphatic drainage to help reduce edema. KinesioTape has been around for several years but has recently become more popular due to many Olympic and professional athletes being seen on TV with KinesioTape on. X-Rays are available and taken if necessary to help diagnose the cause of pain. X-Rays are useful in ruling in or out certain conditions such as fractures, arthritis and other degenerative conditions. The Doctors use their discretion to know if X-rays may be helpful in further evaluating your condition.